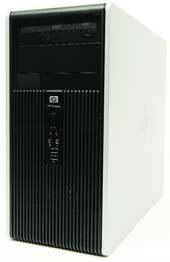 Reviewer's Comments: The DC5750 MT is one of the new green PCs from Hewlett-Packard. It performs like a normal PC but has many features to make it more environmentally friendly. These days, it seems like everybody is trying to do their part to help the environment. Global warming is increasingly becoming recognized as a fact of life, and even those who dispute it can still probably agree that pollution is bad. Hewlett-Packard is chipping in with its new line of eco-friendly PCs. Called green PCs, the systems run the gamut from entry-level data processors to high-end, near-workstation-class systems. The dc5750 model we tested is a moderate-performing desktop system in about the mid-range of the new lineup. One of the best things about these new PCs is that they work just like a normal system. On the surface, there don't seem to be any differences at all. So you can do your part to help the environment without any detriment to yourself or your work. All of the greener features are inside; a lot of them have to do with the power supply. As the first line of defense against wasted power, the fan that cools the power supply is managed by the BIOS. So you can set the fan's idle speed to high or low. You don't really need the fan spinning at maximum speed most of the time, especially if the PC is in a well-ventilated, climate-controlled space. Lowering the fan idle speed can also make for a much quieter workspace, since almost all the noise, at least the constant type, generated by a PC comes from the fan. It's sad that all that fan-spinning in most PCs is just wasted power and extra noise. The power supply is an active power factor correction (PFC) type. That means it uses a circuit to correct the power factor, enabling high efficiency. Active PFC also markedly diminishes total harmonics, automatically corrects for AC input voltage and is capable of a full range of input voltage. So you could plug it into either 120v or 220v power and the system will automatically compensate. And really, a system designed to swing from 120v to 220v can handle a little power surge every now and then. Any power that runs through the active PFC is cleaned up so only a pure sine wave is gently fed into the system's other components. Most systems, if they have PFC at all, contain a passive PFC, which is not nearly as efficient as the active type found in the dc5750 and the rest of the greener lineup. The HP system we tested achieved 80 percent efficiency, whereas most systems peak at only about 65 percent. Not surprisingly, active PFC power supplies cost a lot more than the passive types. But these increased costs do not seem to have been passed on in the dc5750. Our system only cost $809, which is extremely reasonable given the advanced components that make up the power supply. The emphasis on efficient power not only makes the dc5750 affordable but also should extend the life of all the system components. Another power-saving feature of dc5750 is the processor. Processors take up more power than any other component in most systems, with the possible exception of high-end graphics cards. All the systems in the new green lineup have efficient chips that work well at lower voltages. Our dc5750 had a 2.4 GHz Advanced Micro Devices Athlon 64 3800+ processor. On the GCN/Alterion benchmarks, the dc5750 scored 9,594, which is more than enough horsepower to deal with any office application. Sure, there are workstation-class systems with a little more oomph, but the dc5750 does what it is designed to do very well while not gobbling up a ton of power. A side benefit to all this power-saving technology that might not be immediately apparent is that the dc5750 generates almost no heat. After having the system powered in the lab for more than three days, you could put your hand right in front of the exhaust fan behind the unit and feel a nice stream of cool air coming out. On most PCs, it would feel more like a small space heater pushing warm air out into the room after three days of rigorous testing. The cooler operating temperature of the PC means that the environmental temperature of the room it is in is not raised much. If you have ever grouped a lot of systems together, you know that the temperature of that workspace can rise quickly. We have seen eight systems raise the temperature in the GCN Lab by two degrees in less than 30 minutes. The end result? The air conditioning cranks up and begins blowing out cold air to compensate. However, if you grouped several green PCs, such as the dc5750, the air conditioning sensors in your workspace wouldn't detect much of a rise and thus wouldn't activate nearly as much, saving both money and the environment through lower power consumption. The dc5750 is so well put together that it's the first system compliant with the new Energy Star 4 standard, which goes into effect July 20, although we hope more systems will quickly follow. The dc5750 has all the equipment you would expect from a desktop PC, including 1G of DDR2 RAM, an 80G 7,200-RPM Serial Advanced Technology Attachment drive, and a 48X/32X SATA DVD/CD-RW combo optical drive. There is also a 1.2 Trusted Platform Module embedded security chip. As a little green icing on the cake, the dc5750 comes in environmentally friendly packaging, and HP has a recycling program for its PCs. The best thing about the dc5750 is that it works well while also being friendly to the environment. Unlike building your own compost heap or even recycling your soda cans, the new HP lineup will let you go a little greener without any real effort. And that is something we can all live with.